Q. How can I get Oriya in Windows? A. Windows XP does not have support for Oriya. That has been included in Windows Vista. 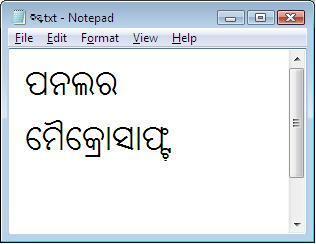 The opentype font used for Oriya is called Kalinga. Vista has the Oriya locale also. One can have date, time, currency in Oriya. 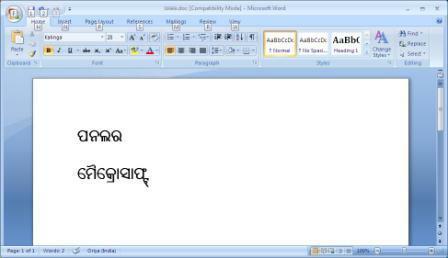 One can also have the files with names typed in Oriya. Windows explorer will properly sort the files as per Oriya sorting order. Shown below are two screenshots -one from Notepad and another from Word 2007.